Dining rooms provide a wide range of flooring options allowing you to choose any floor choice and any look you want, all capable of delivering the outstanding visuals and performance you need for this busy work space. Rather than rank which is best, we’ll talk about the benefits of each and let you decide. Whichever you choose, avoid the low end and stick to mid price ranges and higher. Hardwood is the most natural choice. There’s something genuinely wholesome about a hardwood floor that makes it perfect for a dining room. You won’t have to worry about normal day-to-day wear just make sure to keep it clean and use furniture pads. If your dining room is a little more active but you still want realistic visuals, you may want to consider laminate. With all of the looks of hardwood or stone, plus superior performance against stains and scratches, laminate flooring may have found its perfect home here. 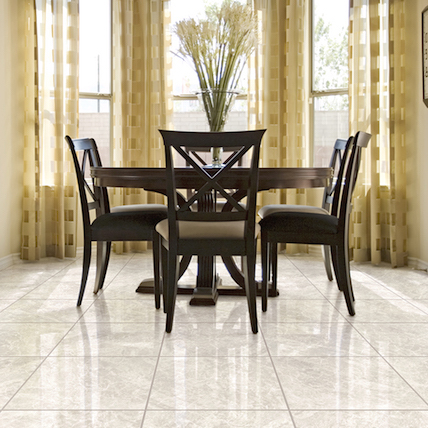 Ease of maintenance is also a deciding factor in laminate’s favor for dining rooms. LVT/P, WPC and rigid core vinyl may be even better against dropped food and everyday messes than laminate, although the visuals tend not to be as realistic. Then again, you won’t ever have to worry about spills. Ceramic tile, let’s face it, can go anywhere in the home and is always a great choice. With its unlimited design possibilities, you can let your creative spirit soar. Carpet? Yes! Not only is carpet now famous for its stain resistance, it brings color, texture and pattern to any space. One thing carpet can do better than most other flooring, it can help coordinate and complement design motifs and color choices across other rooms of the home. It also helps keep the noise down. For a classic look, try an area rug under the dining room table. Make sure it is large enough to define the space and that it reaches under all chairs.